All transactions are safe and secure with a reliable history in online purchasing behind each of our associates. Buy the Cullen Family Crest t-shirt to own Eclipse clothing and merchandise. One of the events that we have all been waiting for has arrived in the Eclipse movie, the engagement of Miss Bella Swan to her dear Mr. Edward Cullen. Although Bella is not interested in the thought of marriage, she agrees and our anticipation is redirected to their upcoming nuptials. Along with this decision, she gains sisters in Alice and Rosalie; brothers in Emmett and Jasper; and a second set of parents in Carlisle and Esme. Celebrate her new family with one of these Cullen Crest Twilight Eclipse t-shirts. Be sure to check out Bella's engagement ring below. 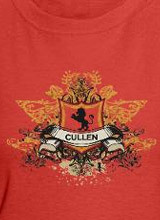 In addition to the Cullen Family Crest tee above, browse the Eclipse Clothing Gallery for more apparel like men's and women's clothes, kids shirts or hoodies.